Offspring3 went to Spain for 5 weeks this summer for a study abroad program. Of course I stashed some cards in her suitcase. For the times that Skype and Facebook messaging were not quite tactile enough. Most of the cards contain an image or paper that she has gifted me. Categories: card, caring, encouragement, I love you, note, thinking of you | Tags: American Crafts, Amy Tangerine, Avery Elle, Basic Grey, Copics, Darice, Essentials by Ellen, Fiskars, Heidi Swapp, Hero Arts, JustRite, My Favorite Things, Neenah, On A Whim, paint chip, Paper Smooches, Poptone, Pretty Pink Posh, Recollections, Taylored Expressions, Waffle Flower | Permalink. I am working on notecards for a different project. Kitchen countertop got installed yesterday – it looks like a kitchen. No running water yet (that is scheduled for TODAY). I was so worried about the counter – I selected it from a 6 x 6 inch sample. Had nightmares about it Sunday night – “what if I chose WRONG? WHAT IF I DON’T LIKE IT? ?” All is good. I am happy with how it turned out. Supplies: Stamp – Stampin’ Up!, paper – Stampin’ Up! Calypso Coral, Kaleidoscope DSP, Pool Party, So Saffron, ink – Hero Arts Unicorn, die – Taylored Expressions, punches – All Night Media (small flower), Fiskars (large flower), Stampin’ Up! (dots), embossing powder – Filigree Fine Art Powder white. Categories: card, note, thanks | Tags: All Night Media, card, Fiskars, Hero Arts, Neenah, Stampin' Up!, Taylored Expressions | Permalink. I sat down on Sunday morning, to make a card for Monday’s blog post. No mojo. SIGH. I pulled out my scrap folders, and found some things that worked together. Kitchen is moving along. I clean for at least an hour after they leave (maybe 2). I know there is some drywall sanding happening this week – maybe I need to tape up plastic drop cloths in an attempt to contain that. No news on the kidney stone that was in the way. I am feeling almost normal (since Friday) – which is good. Supplies: Stamps – Cornish Heritage Farms, Papertrey Ink, paper – Neenah Classic Crest Solar White, Stampin’ Up! Green Galore (retired), Lovely Lilac (retired), Orchid Opulence (retired), Pacific Point, inks – Stampin’ Up! Green Galore (retired), Lovely Lilac (retired), Tempting Turquoise, VersaFine Onyx Black, die – Lawn Fawn, flower punches – Fiskars, sequins – Darice (large), Pretty Pink Posh (small), embossing powder – Ranger Silver Pearl, organdy ribbon – Offray. Categories: birthday, card | Tags: card, Darice, Fiskars, Lawn Fawn, Neenah, Offray, Papertrey Ink, Pretty Pink Posh, Ranger, Stampin' Up!, Tsukineko, VersaFine | Permalink. 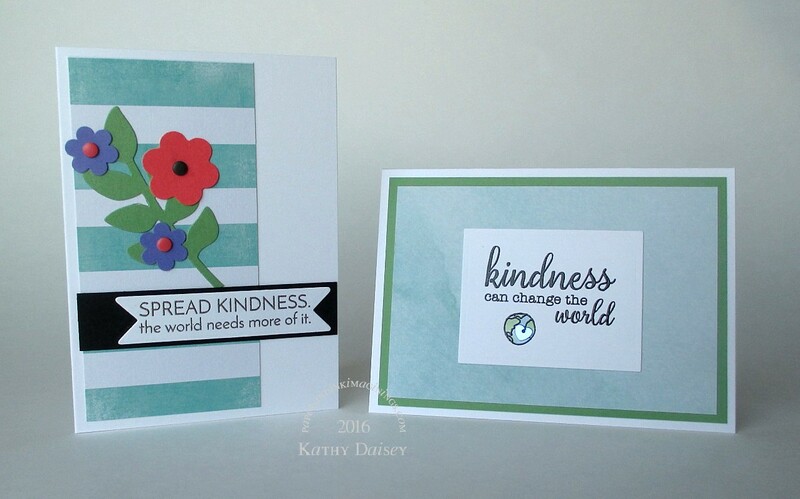 Simon Says Stamp just released a new stamp set called Uplifting Thoughts. Holy moly, this set packs a punch! Ten sentiments I know I am going to use again and again. I will try to show you all 10 sentiments over the next few weeks. Supplies: Stamps – Simon Says Stamp, paper – Heidi Swapp Favorite Things, Neenah Classic Crest Solar White, Stampin’ Up! 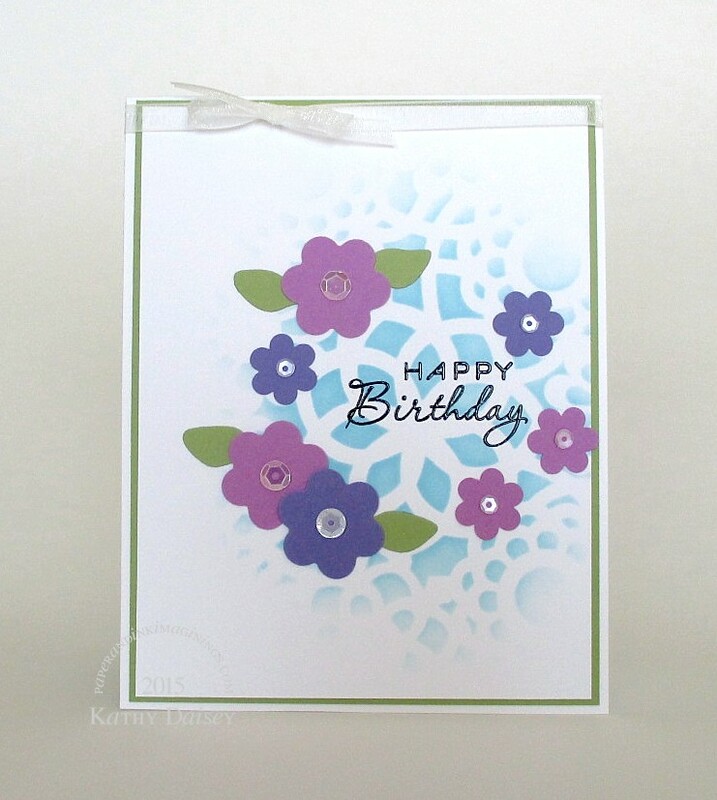 Basic Black, Calypso Coral, Lovely Lilac (retired), Painted Blooms DSP, Wild Wasabi, inks – Stampin’ Up! Marina Mist, Wild Wasabi, VersaFine Onyx Black, dies – Spellbinders (rectangle), Stampin’ Up! (foliage), Taylored Expressions (banner), flower punches – Fiskars, enamel dots – Stampin’ Up!, heart sequin – Stampin’ Up!, embossing powders – Filigree Fine Art Powder clear, Ranger Liquid Platinum. 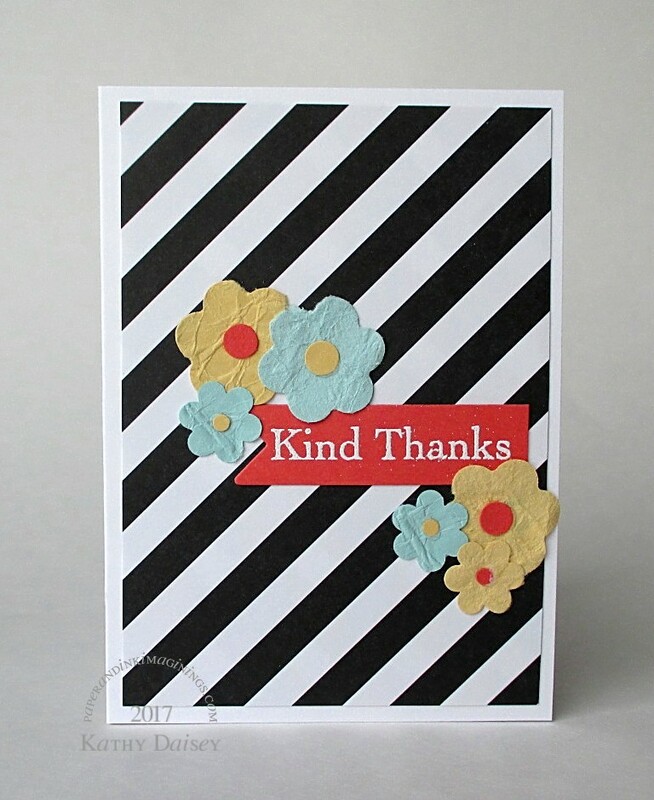 Categories: card, encouragement | Tags: card, Fiskars, Heidi Swapp, Neenah, Ranger, Simon Says Stamp, Spellbinders, Stampin' Up!, Taylored Expressions, Tsukineko, VersaFine | Permalink. When I started blogging back in 2013, I never expected to make virtual blogging friends. But it has happened. I like that we encourage each other! One of them is Nicole, The Paper Baker. Early in November, she posted that her birthday month is November, and she asked if any other bloggers (or readers) would send her a birthday card. I made this for her. I stenciled a background with Distress Ink, and mounted punched flowers around the embossed sentiment. Supplies: Stamp – Papertrey Ink, paper – Neenah Classic Crest Solar White, Stampin’ Up! Lovely Lilac (retired), Orchid Opulence (retired), Pear Pizzazz, inks – Tim Holtz/Ranger Distress Ink Tumbled Glass, VersaFine Onyx Black, die – Stampin’ Up!, stencil – Heidi Swapp, flower punches – All Night Media (small), Fiskars (large), sequins – Doodlebug Designs (large), Pretty Pink Posh (small), embossing powder – Filigree Fine Art Powder clear, organdy ribbon – JoAnn’s. 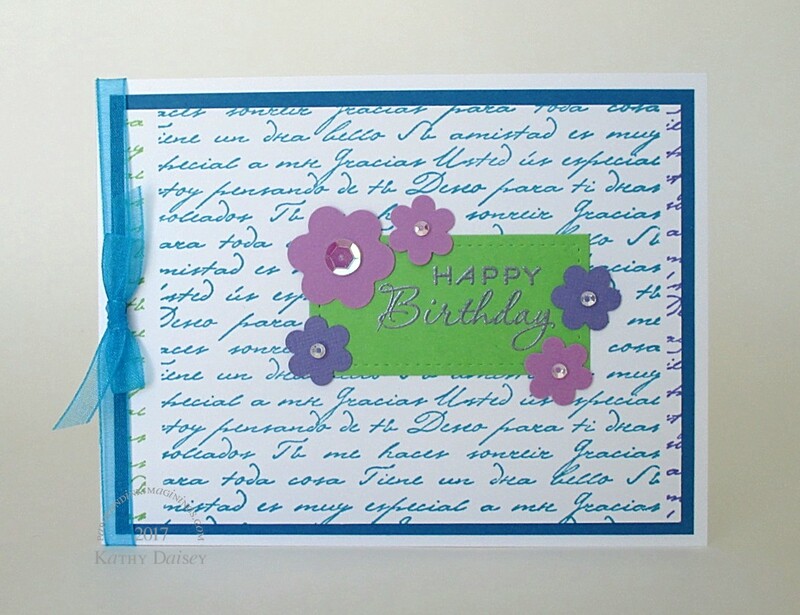 Categories: birthday, card | Tags: card, Doodlebug Design Inc, Fiskars, Heidi Swapp, Neenah, Papertrey Ink, Pretty Pink Posh, Ranger, Stampin' Up!, Tim Holtz, Tsukineko, VersaFine | Permalink. A PINK card for my basket! Supplies: Stamps – Reverse Confetti, Stampin’ Up!, paper – Neenah Classic Crest Solar White, Stampin’ Up! Pink Passion, Pixie Pink, inks – Copic E21, Tim Holtz/Ranger Distress Ink Picked Raspberry, VersaFine Onyx Black, stencil – Simon Says Stamp, dies – Lawn Fawn (stitched rectangle), Spellbinders (circles), heart punch – Fiskars, embossing powders – Filigree Fine Art Powder clear, Stampin’ Up! Sterling Silver, organdy ribbon – JoAnn’s. Categories: baby, card | Tags: card, Copics, Fiskars, Lawn Fawn, Neenah, Ranger, Reverse Confetti, Simon Says Stamp, Spellbinders, Stampin' Up!, Tim Holtz | Permalink.